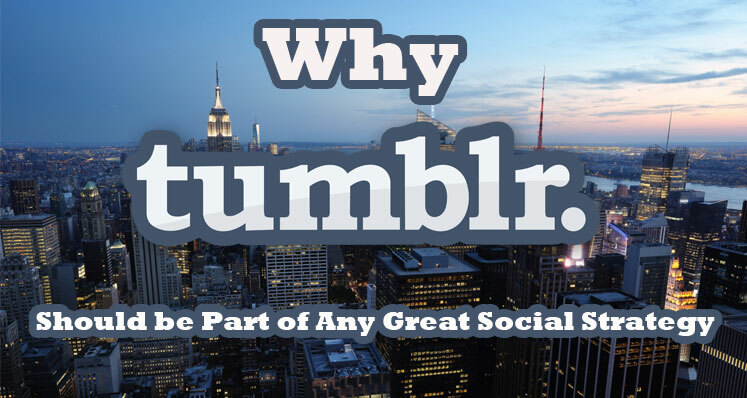 Tumblr is a micro-blogging platform that often gets forgotten when it comes to a brand’s overall social strategy. According to Quantcast, the site is most popular with users under 34 years old and it generates high levels of engagement among those who use it. Although Tumblr may not seem as glamourous as the other big social platforms like Facebook and Twitter, it is continuously growing in both users and engagement levels and is not something to be overlooked. According to Forbes, 120,000 new Tumblr blogs are created every single day, meaning that the total is currently at around 168.4 billion. Every month over 199 million people visit the site, and the engagement levels between 2012 to 2013 grew by 251%. With a very youthful demographic and a skew towards short form content, Tumblr is not a platform your brand should be missing out on. It is perfect for content marketing, particular when it comes to visual content. The platform allows you to share content, build a fan base and develop your brand’s identity. There are tons of different ways that brands can use Tumblr, and the platform is totally customisable meaning you can make your business Tumblr blog look more on-brand than any of your other social media profiles. Whether you want to promote a new product or service or just highlight any deals or discounts you may currently have, Tumblr is a great place to test out different types of campaigns and strategies and share things with your audience. Take a look at a few other Tumblr blogs before you get yours up and running, as it will give you an idea of what other brands are doing with theirs. The majority of content is short and snappy and unique, but a lot of content is “reblogged” too, so don’t be afraid to put your own spin on some existing content. Tumblr is an incredibly simple platform to use, once you have set up and branded your blog, it is time to start creating content. Think about the demographic you will be targeting and make a content calendar for future content. Once you have published a post, you will need to make sure it gets some exposure, especially if your blog is new. The best way to get your content some exposure in the Tumblr community is through commenting, liking and reblogging. When you comment on someone else’s blog, not only will you be encouraging engagement, but it will also leave a link to your blog on the comment. This will allow other Tumblr users to easily find your content. Another route to take is through tagging photos. Choose relevant keywords to tag photos in your posts with and users will then find your content when they search for that word on Tumblr. In regards to optimisation, Tumblr blogs work much in the same way as regular blog posts. You can still use contextual keyphrases in your content, you can still customise URLs and you can still use the “alt text” attributes on any pictures you use. You can also optimise titles and descriptions and you can even create a site map, which can be submitted to Google. As the saying goes “content is king”, and Tumblr is a fantastic platform on which brands can focus on the content they are promoting and really concentrate on the audience they develop. Tumblr is ideal for generating content and communicating with fans, so you need to keep that in mind when creating your social strategy. There are so many different ways you can utilise this micro-blogging platform and it is a great place to demonstrate brand transparency. Plan your content, build your network, engage with the community and keep your audience coming back to your blog time and time again.